When the Phone window is open, you can simply start typing a telephone number on your keyboard. 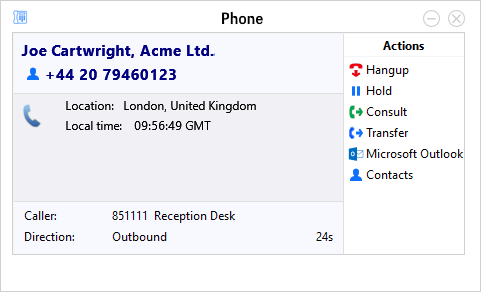 Go Integrator Client will understand that you want to make a call and switch to the Make Call screen. 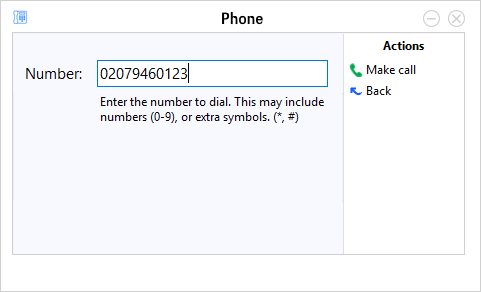 The Phone window allows you to interact with the current call in a number of ways. Users can also click any buttons showing integrated application names to open the caller's record in those applications. The name and telephone number of the remote person. Use these buttons to interact with the current call and contact. Other information about the current call.